A feature packed guided experience, of the towering sea cliffs and fresh air at the South Western tip of Africa. 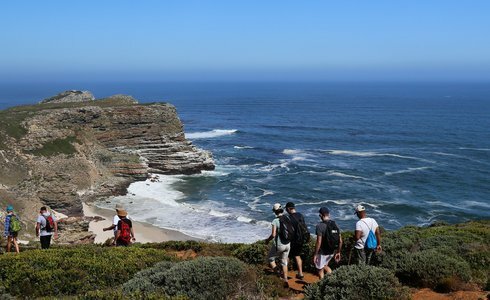 The Cape Point Day Tour will deliver some of the most breathtaking ocean and mountain scenery in the world. Globally recognised for its extraordinarily diverse and unique fauna and flora, Cape Point is a must-see for any tour to Cape Town. Highlights of the half day and full day Cape Point Tour include visiting the Kirstenbosch Botanical Gardens which hosts some 4000 species of indigenous plants from all over South Africa. Take the funicular to reach the viewpoint of the Cape of Good Hope which offers breathtaking views, or head to the Hout Bay Harbour for lunch. Other attractions include the penguin colony at Boulders Beach and Chapman's Peak, one of the city's top tourist attractions. The half day tour covers the same attractions, however the stop off times are much shorter, less frequent, and exclude the penguin colony. Highlights Include: Atlantic Seaboard -Clifton, Camps Bay, Twelve Apostles Hout Bay harbour (optional boat trip to Seal Island) Cape of Good Hope Nature Reserve, Cape Point lunch at seaside restaurant (not included in the cost) Boulder's Beach Penguin Colony, Kirstenbosch National Botanical Gardens. Please note: This tour can be completed on a private basis or joining a group with other passengers, this tour can also be run as a half-day or full-day excursion.